If you're a self confessed beauty addict like me, I'm sure you have a list in your iPhone notes app of what you want to try next. I have done just that, but I thought I'd share with all of you. 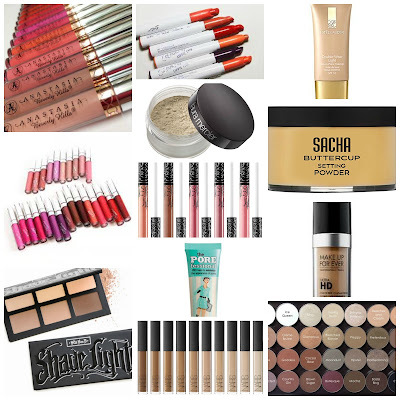 A lot of the products are high end but this purely because I have a lot of drugstore products and I want more quality products in my collection. Pigmented, non sticky and beautiful shades! Not much more to say here, but I haven't been into glosses for the longest time, but I have to get my hands on these. Specifically shades, Sepia, Tara, Warm Bronze and Potion. I already have quite a few high coverage foundations and one light coverage tinted moisturiser, so I wanted something in between. I've had samples of the double wear light (shade 4.5, if you're curious) and I love it! I just haven't had a chance to pick it up. I've heard raving reviews about this powder, especially for oily/combination skin, so naturally I want to try it. As it is translucent, it's perfect for all skintones. A woman of colour friendly setting powder and is apparently better than the Ben Nye banana powder. Once I get my hands on it I'll definitely review. Yellow powder are good for setting undereye concealer and the yellow counteracts dark circles. Again, I've heard great things and I'm excited to try as I've been obsessed with matte lips. I have a huge list of shades I want so here goes: Beeper, Kapow, Limbo, Lax, Guess, StingRaye, Solow, Tulle, Succulent, Avenue, Trap and High ball. I of course can't get them all at once but I can be patient. All these shades are of course woman of colour friendly. I've heard better reviews on these than on the ABH ones, but I don't think I'll pick them up until I do a big Sephora shop as they're not worth the extra expense at the moment. I like the shades that come in this palette compared to the ABH one as the shades look cooler and more ashy and woc friendly (something that is extremely lacking in the UK). Again, I will buy in a Sephora order. I love my LA girl concealers but I think I'm ready to try a high end end one and Nars bases have never let me down. I have quite large pores and when I want a flawless finish, I think this product will be essential for that. Now that I've recently got more into shadows, I want my own palette full of my favourite shades so I can start doing more experimental looks. And 12 products later, I'm done. There are more which build up everyday, but I'll save that for another post. Reviews and hauls are a coming ;). Let me know what's on your wishlists.